Numark Antiseptic Wipes have been formulated to cleanse and help protect the skin against infection. 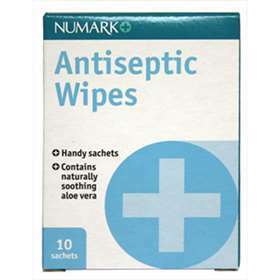 Numark Antiseptic Wipes are quick-drying and contain naturally soothing Aloe Vera. Numark Antiseptic Wipes contain naturally soothing Aloe Vera. Remove antiseptic wipe from sachet and unfold. Dry skin gently but thoroughly. Discard with normal household waste. Aqua, Alcohol denat., Glycerin, Chlorhexidine Digluconate, Aloe Barbadensis, Citric acid, Propylene Glycol.